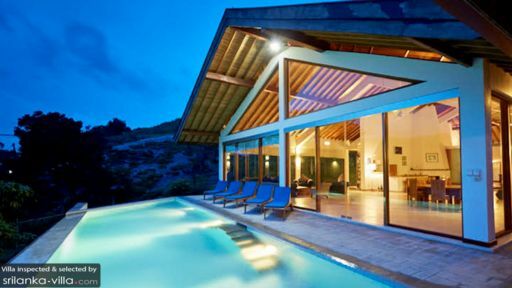 Situated in the famed city of Digana, Sri Lanka, Glasshouse is a private villa with four, well-furnished bedrooms enclosed within glass walls offering sprawling and panoramic views of the lush, natural vegetation that surrounds the villa. A homely ambiance, comfortable living spaces, an infinity swimming pool, and proximity to major cities in Sri Lanka make Glasshouse the number one choice among travellers, especially those accompanied by families or groups of friends. You can easily travel to Kandy and visit the Tooth Relic Temple, the ancient ruins in the cultural triangle, or head to the National Parks for a hike! Four, well-appointed and large bedrooms are offered at Glasshouse Kandy and each has been furnished similarly with king beds for a comfortable night’s sleep. There are large glass doors that lead to a private veranda or the garden, so you can kick back and relax as you breathe in the fresh air and let your eyes soak in the mesmerizing view of the hills and water abundant. Soothing white walls and simple décor keeps the bedrooms vibrant for you to feel utterly relaxed and at ease. Each of the four bedrooms houses an en-suite bathroom that is fitted with necessary amenities. A gorgeous infinity swimming pool dominates the outdoor space at the Glasshouse and it sits facing the verdant foliage of luscious gardens that can be enjoyed endlessly. 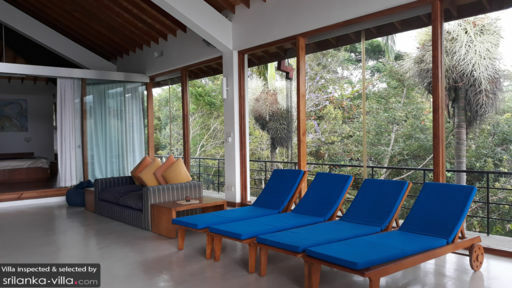 With sun chairs found on the accompanying pool deck, you can easily lounge and sit back while taking in the beautiful scene in front of you or simply basking in the tropical sun! Swim in the cool, crisp water of the pool or doze off on the lounge chair for a relaxing and replenishing time in a place where nothing and no one will disturb your peace. Under a shingled gazebo, you’ll find an alfresco dining area for the perfect BBQ that can be arranged upon request! Staying true to its name, Glasshouse features living and dining spaces that are enclosed within glass walls providing infinite and expansive views of the neighbouring sights in Digana as well as abundant sunlight. The poolside living area is as good as being open-concept with its glass walls and sliding glass doors that either lead to the pool deck or a balcony that wraps around the villa. A spacious layout and a seamless blend of nature with indoor living allows for a comfortable, airy, and cheerful room where guests can enjoy with loved ones. Relish a glass of wine as you lounge on the comfortable sofas and gaze at the scenery! If you wish to dine indoors, there is a round table in the living room with seating for up to eight guests, set amidst all the natural grandeur just a glass wall away. Dig into delicious feasts prepared in the warm and homely kitchen that is fully-equipped with wooden interiors and window with a view! For bibliophiles, there are shelves upon shelves lined with classics, bestsellers, and more than one penny dreadful that you can devour without interruption. There are plenty of services being provided to guests at Glasshouse to ensure that you have a memorable trip. The staff is kind and generous catering to your needs with pleasure, so everyone has what they need. If you want a change of scene from the pool, you can go horse riding or have a go at the golf course, both of which can be arranged at a special cost. You can also arrange for transportation to take you around town. 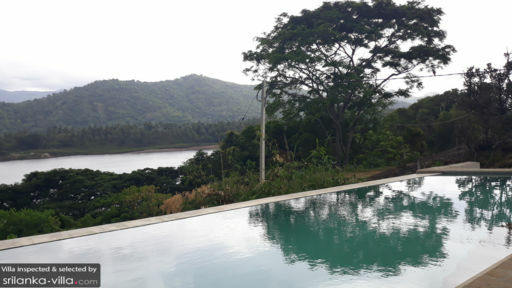 Glasshouse is found in Digana, a village in Sri Lanka, which offers a laidback and restful vibe to tired travellers looking for a retreat and some time out from busy lives. For exploration, there is always Kandy, a mere 24 km away from the villa, where you have a plethora of fun things to see and do! You can visit the National Parks, or ancient ruins, unless you’d rather hike across the many natural wonders in town that are awash with precious, lush greenery!